I'm struck today by the tendency we humans have of jumping to conclusions, by the swiftness with which we can reach assessments. "What a jerk!" or "How dare she!?" for example. Even "She's a saint!" The slow guy in front of me taking his sweet ol' time making his left turn: to him I say aloud, rolling my eyes, in the containment of my car where he could not possibly hear me, "Are you sure, now?" And just as soon as those words are out of my mouth, I remember a minister-friend telling the story of a woman grieving the sudden death of her parents. How that affected her driving, her walking, her talking: she wasn't herself, as we say, her reflexes dulled, slowed by her sorrow. Always assume the best, leave room for a person's circumstances: this is what I took away from that story. And today, I am glad I didn't honk at the guy slow to turn. I'm also glad when I don't honk at the car stopped in front of me at a green light--for no apparent reason until the reason is revealed: kid chasing ball. Person in wheelchair crossing, or the like. When I remember, I give people 'the benefit of the doubt,' as we say. I could say I've been on the receiving end lately of a flurry of snap judgments. Judgments which left little or no room for the benefit of doubt. But more and more--and especially after yesterday--I see how not personal it all is (except of course when it is). It would seem that I am simply at the effect of the reflex of a mechanism apparently programmed to judge, to blame. It's funny, when you think about it. That we can all be walking around thinking (usually without even knowing that we're thinking) that this guy and that guy and the other guy is out to get us. We don't say it that way; we say they're mean or deceptive or dismissive or whatever. When I wrote about "The Slasher," I left out the thought that maybe this stick action with the flowers was venting something for this kid, and keeping him from reaching a boiling point that would provoke him to much more violent acts. I didn't say that I thought maybe he's lashing out about a troubling situation at home. Who knows? There are all sorts of reasons a kid might whack flowers like that--simple unconsciousness being one of them. But I don't know, I can't know the real reason. What I see, though, when I look more closely is this: it's not personal. To the other it might be personal--even justified: by X statement or Y omission or Z action, I am revealed to you as the jerk that I am--perhaps you've made such a judgment based on something I've written here. Or you are revealed to me as the jerk that you are. Keep this up long enough and what am I but surrounded by a bunch of jerks! So what is up with this picture? I heard a radio DJ make a public apology today to Paula Abdul for saying she looked drunk at an interview earlier this year. Turns out the talented songstress was diagnosed with reflex sympathetic dystrophy two years ago, and can unexpectedly experience symptoms at times that might be mistaken for intoxication--swaying, slurring of speech. "She says it's character defamation," said the DJ before she apologized. Well, it is character defamation, is it not? We do this, don't we. We jump to all sorts of conclusions--even "good" ones. 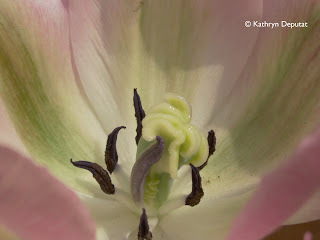 I took this photograph in my garden a few days ago. I shot the bleeding hearts last year, and have several images of them that I like, but I tried it again just the same, to see what I might turn up. There was bright sun this day for one thing, which was missing in the old shots. 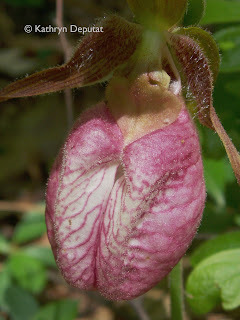 I was surprised, as I compared the new images, to discover something that I've never noticed about this sweet and so very distinctive flower, a flower that has caught my attention since I was a girl. Only yesterday did I realize that the "arms" (sepals?) start closed tight at the base, then open up to the sides gradually as they bloom ending, after some time, up against the heart part. (All three stages are evident in this image here.) So what, you may think. So this: I consider myself to be a keen observer. It is not unusual for me to hear comments about this: "Boy, you don't miss a trick, do you?" 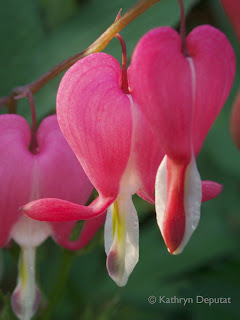 But after years--decades--of looking at the bleeding heart and not seeing that detail, a central not even a peripheral detail when you think about it, I have to stop and ask myself: what else am I not seeing? Yesterday, I returned to my Alma mater for a walk around Lake Waban on a quest for lady slippers and a sighting of the four new cygnets born to their parent swans last weekend. I was filled up--fulfilled and then some--by these and some other unexpected beauties of the wood. 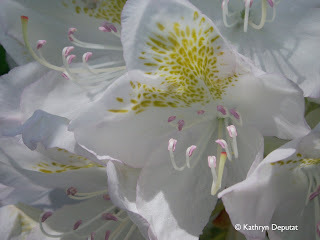 But this white rhododendron in particular--lovely enough with the naked eye, but absolutely spectacular in close up--has stopped me in my tracks. How about those colors: that mustardy-olive splatter above a pistil terminating in fire-engine red, surrounded by stamens capped with pink- lavender anthers, and the flower petals edged ever so subtly in lavender: who thought of this?!!? If a person tried doing what this flower is "doing," what are the chances we might call him or her showy or weird or creative or splashy or funky or... ? You might look at this flower and call it hideous. 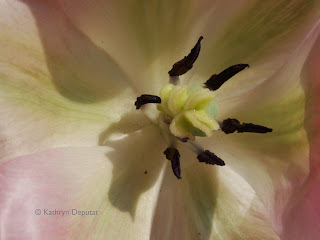 I look and see a crazy, exquisitely gorgeous life expression. I see freedom and perfection. I see magnificent design. I see brilliance, in every sense of the word. I also see a particle of Love, the Life Force, not trying to be baudy or funky or hideous or brilliant. It is just being IT, whether I like it or not, whether I notice it or not, whether I approve or disapprove, with or without my resistance--nothing personal. Just like you, and me, and the guy slow on the turn, and the golf buddy who's chronically late, and the prospect who won't return calls, and the kids who track mud in the house, and and and. It's not personal: got it. Maybe by the grace of Love's countless reminders, I'll even remember it and, as art imitates life, let life imitate Love. For the past seven weeks, I've been sporadically observing three bald eaglets as they've matured from their early downy fluff to their now adult stature by way of the Norfolk Botanical Garden's Eagle Cam. Tuning in this afternoon to monitor their progress, I found two of the three flapping more deliberately and sustainedly than usual, as well as flying from one side of their 800-pound nest to the other. I instantly burst into smile, and my breath caught: they are so close to flight. I think it's a miracle that they've made it this far, out there in the elements and prey to who-knows-what hour after hour, day and night, week upon week. Now there is first flight in their very near future; they're expected to take flight around Memorial Day, viewers (numbering around the one million mark, I read) have been told. As I watch them try their wings, I feel their discovery, their teetering between staying and going. I swear they are excited: I feel it. It is clear that they now understand that what they've watched their parents do all these weeks--flying to and from the nest with or without food, day after day--they can do as well. They are about to follow. I try to forget the statistics I've read about survival rates (about 50% survive their first year) as I look on with a parental sort of pride and more than a modicum of concern. I hold my breath and await, one by one, their lift off...any minute now, it would seem. This morning, when I stepped outside after my daily lap swim, I was met with an eyeful, armful, heart full of sky. Not just any sky. A sky like I've never seen. Clouds of varying sorts were scattered across the canvas of blue as if arranged for my viewing: this sky beckoned. For the first time in my life I felt what I suppose anyone with a passion for flying has felt: "I want to fly that sky," I said aloud. My next thought, crazy but true, was "why not?" Get a pilot's license at 40-something? We'll see about that. But in the meantime, I can feel it already: when the eaglets lift off from that Virginia nest, my heart at least, if not the rest of me too, will lift off right along with them, and I will find myself soaring. "The slasher," I've dubbed him, this kid who passes through the neighborhood now and then wielding a switch-of-a long stick, hacking machete-like at any lovely green or flowering thing along his path. So far my garden has been spared. Lucky for me, I was in the street chatting with a friend when, trailing behind his mom and sister, he made his move on my Siberian iris. My holler stopped him mid-slash. His mother turned and looked at me. "He was about to whack those flowers." I pointed to the patch. "I've told him not to do that..." she offered, and I waved it off, smiled. "It's okay," I said, and it was: no harm was done. But what about next time? I couldn't help but wonder. I only knew what he was up to because I'd watched through the kitchen window, aghast, one day last week as he sliced mightily across a bed of creeping phlox in full flower across the street. When three days ago I discovered a patch of decapitated tulips up my sidewalk a ways, I knew the slasher had struck again. The flower heads had yet to wilt fully, so I gathered all five and brought them inside with the hope of reviving them. With clean cuts to their barely two-inch stems, in a short vase of water, revive they did. 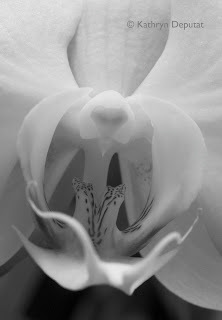 That pleased me, as it pleased me to fall to sleep that night with their subtle fragrance wafting from my bedside table. But the next morning, when they glowed with the new sun, I appreciated even more my bittersweet boon. Out came the camera, and now, having seen up close what exactly had been taken down by the slasher with one clean sweep of his switch no doubt, I am compelled to speak about it, to share it here. Certainly if my slasher friend saw these images, if he knew (which I assume he doesn't) that it takes about 50 weeks of preparation each year for a tulip to give us the at best (if, say, a premature heat wave doesn't sizzle them in a day or two) two weeks of glory, if he knew that the bees rely on them for their pollen, and that it takes some special care, actually, to even get a tulip flower out of a tulip bulb at all (for instance, bone meal, and letting the greens fade to yellow before snapping them off) surely he would at least think twice if not think better of taking them down with his stick. 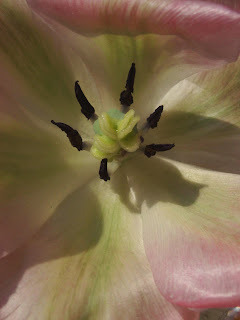 And the woman who planted them, my neighbor Chris, a gardener: I'm sure she didn't select, purchase and place these bulbs in the street-side city tree pit only to see their newly-blossoming stems summarily severed in one hacking sweep--Whack! It's gotta be ignorance that had this happen, right? And the cure for ignorance? What is that if not illumination, understanding, a connection to that which one takes to be separate, unrelated, foreign, irrelevant, expendable, other. I think of Abu Ghraib, of racism, sexism--all the 'ism's. I think of anti This and wars on That, and I say that in every case, only seeing is lacking. It is a sort of blindness that is at the source of violent acts. A case of mistaken identity, if you will. look, see, until you understand. The notion of "other" is a trap. When I look long enough, I see that ultimately there is no other. That means no antagonist, no enemy, no evil force, no conspirator, no tormentor, other than the ones I create. Am I crazy to see a continuum, a direct line between the slasher and the World's wars? All I can tell you is this: the next time I see the slasher, I want to have a talk with him. Not to reprimand or threaten or scold him, which is essentially what I did when I intervened in his hacking into the irises. Rather, I've got an apology to deliver, some questions to ask, some pictures to share, maybe. "The phlox," I might say, "the iris, the tulips: have you looked them in the eye??" And he might look at me funny, but curiosity would keep him there long enough for me to grab his arm and bring him over to give him an eyefull. Then I would watch him begin to recall, watch him come to see himself in their perfect or imperfect, bright and beautiful faces.